Troparion of the Great-martyr and Unmercenary Healer Panteleimon: O struggle-bearing and healing physician Panteleimon, intercede with the merciful God that He will grant our souls forgiveness of sins. Sister Olga and Sister Natalia from the Convent of St. Elizabeth, Minsk, Belarus, will be at Holy Resurrection Orthodox Church in Clinton, July 30th . They will speak and show a video about their ministry to the mentally ill and others. They will also speak at Christ the Saviour in McComb July 29th . More information is available in the handouts located in the hallway. * The Ladies of St. Peter will be meeting at the church next Saturday morning, August 2nd for prayers, breakfast and a brief meeting to discuss plans for the upcoming months. * Katherine Sarah Habeeb will be baptized on Saturday, August 16th at 2:00 p.m. Please keep her and her family in your prayers! During the remainder of July, the traditional fasting continues on Wednesdays and Fridays (no meat, poultry, fish, eggs, dairy, wine and oil). The traditional fasting is also observed from August 1 through August 14 (the Dormition Fast), except on August 6th (Feast of the Transfiguration) when fish and wine are permitted. The traditional fasting=2 0is again observed on the remaining Wednesdays and Fridays of the month; however, a strict fast is observed on August 29th, the Commemoration of the Beheading of the Forerunner. Please supervise your children to avoid spills, ink stains or marks from their writing and drawing on our new chairs. Thank you for your help with this. This entry was posted in Announcements on July 24, 2008 by danrooti7. James 5:10-20: In his epistle St. James sets before us the faithful prophets as examples in how to practice suffering and patience. He also uses the example of the Prophet Elijah to show the effectiveness of fervent prayer. Troparion of the Prophet Elias: O angelic of body, pillar of the Prophets and their corner-stone, the second forerunner of the Coming of Christ, the venerable and glorious Elias, thou didst send grace from on high to Elisha to dispel sicknesses and to purify lepers. Wherefore, he ever overfloweth with healing to those who honour him. 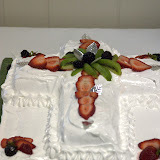 The Eucharist Bread was offered by Rebecca Root for the Divine Liturgy today. Welcome and Many Years to Cliff Stewart who was chrismated last Saturday! * Father John is attending the Clergy Symposium at the Antiochian Village this week. If you have pastoral needs during this time, please contact Father Leo or Father James..
* The Ladies of St. Peter will be meeting at the church on Saturday morning, August 2nd for prayers, breakfast and a brief meeting to discuss plans for the upcoming months. The traditional fasting (no meat, poultry, fish, eggs, dairy, wine and oil) is again observed on Wednesdays and Fridays in July. This entry was posted in Announcements on July 17, 2008 by danrooti7. Saturday, St. Peter’s welcomed Cliff Stewart in the sacrament of Holy Chrismation. God grant you many years! This entry was posted in Announcements on July 14, 2008 by danrooti7. 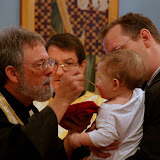 Here are pictures from Jacob’s baptism! Please continue to pray for Father Paul and Matushka Sissy Yerger as she continues to recover from back surgery. Kitchen Maintenance: We have a number of perishable items being left in the kitchen (including condiments, etc., in the refrigerator). These tend to spoil and often attract insects. Following any church event (feast, coffee hour, fellowship, etc. ), unless specific arrangements are made to use left overs very soon, please take them home with you! The final note on our construction loan was $280,000 (which included $16,000 from our original mortgage)!! * Father John will be attending the Clergy Symposium at the Antiochian Village from July 18-25. If you have pastoral needs during this time, please contact Father Leo or Father James. This entry was posted in Announcements on July 11, 2008 by danrooti7.